One of the reasons why I love being Chinese is because we get to celebrate New Year's twice. The Lunar New Year is here again, which means an unending stream of visits, angpows and good food! Here's a simple vector-style desktop wallpaper I created for the New Year. The great thing about this wallpaper is that you can keep it and then reuse it when the Year of the Rabbit comes around again, in 11 years' time. Alright, I'm off to eat MORE pineapple tarts, love letters and bak kwa. 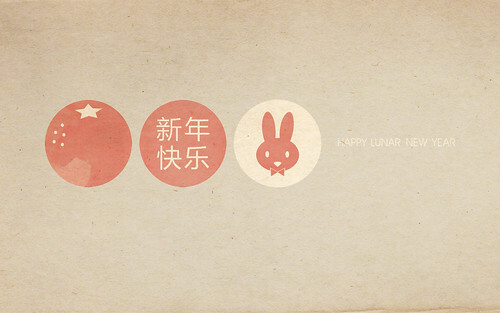 Happy Lunar New Year friends! Have a good weekend!